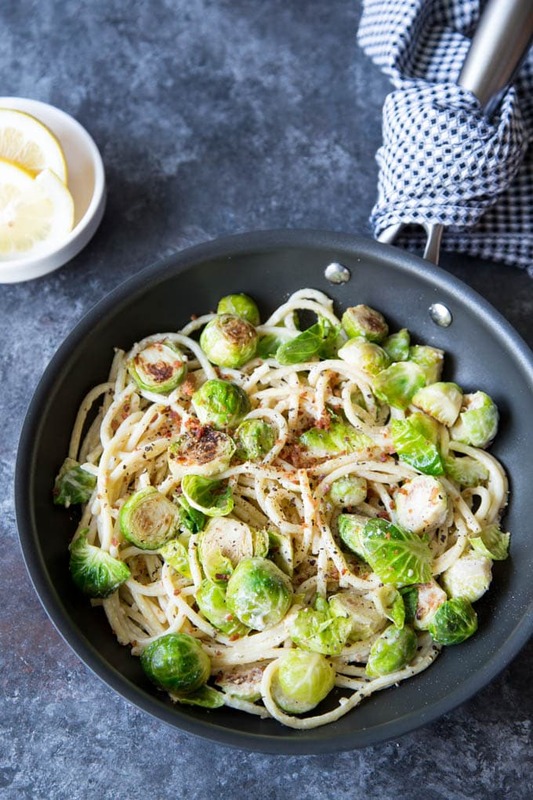 Creamy Lemon Parmesan Pasta + Pan Seared Brussels Sprouts -This quick and easy weeknight dinner is loaded with flavor! 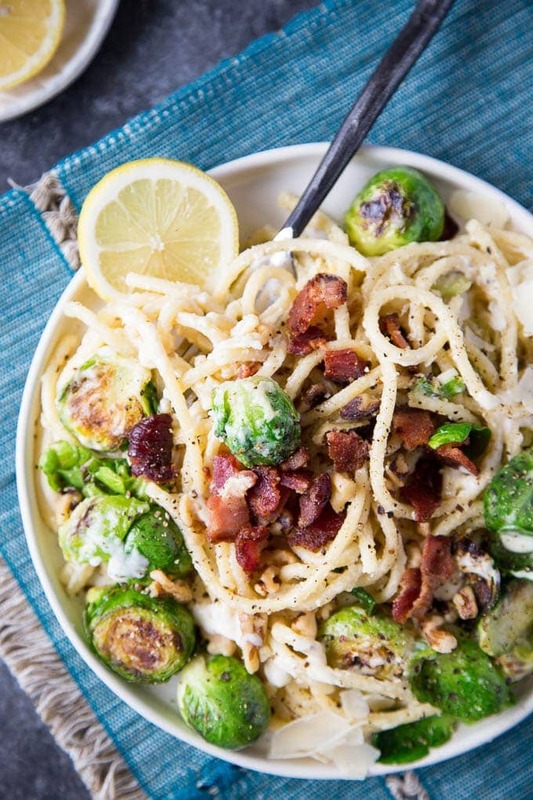 Al dente pasta is tossed in a rich creamy lemon Parmesan sauce and served with Pan Seared Brussels sprouts. Topped with crispy bacon and toasted walnuts. Only 310 cal/serving and on the table in under 30 minutes. Creamy Lemon Parmesan Pasta…oh yes! I think everyone should have a good recipe for creamy lemon pasta in their repertoire . It’s probably one of the easiest recipes ever! and you’ll just need few basic ingredients that can be easily found in any grocery store ( pasta, lemon, garlic, half & half (or heavy cream) and grated Parmesan cheese). The combination of flavors is insane! 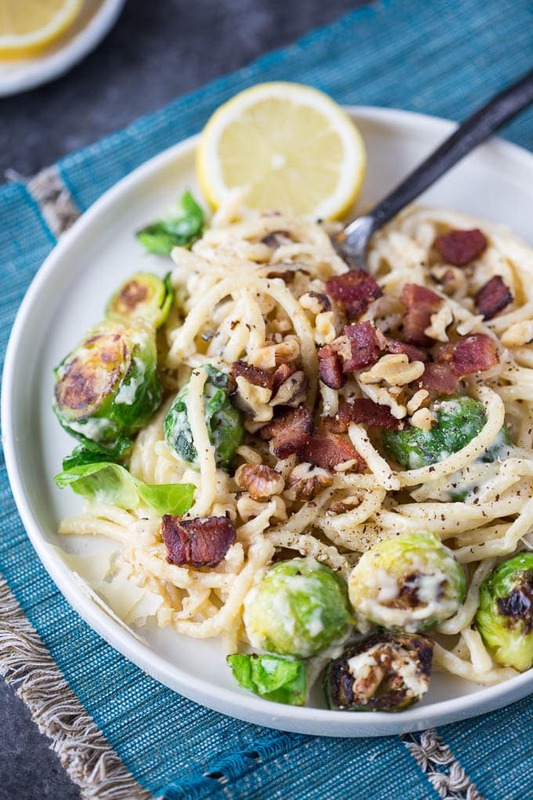 To give this version of creamy lemon pasta more of a “winter” spin I’m adding in-season Brussels sprouts. I’m pan searing the Brussels sprouts to give them a smokey flavor that works so great with lemon pasta. 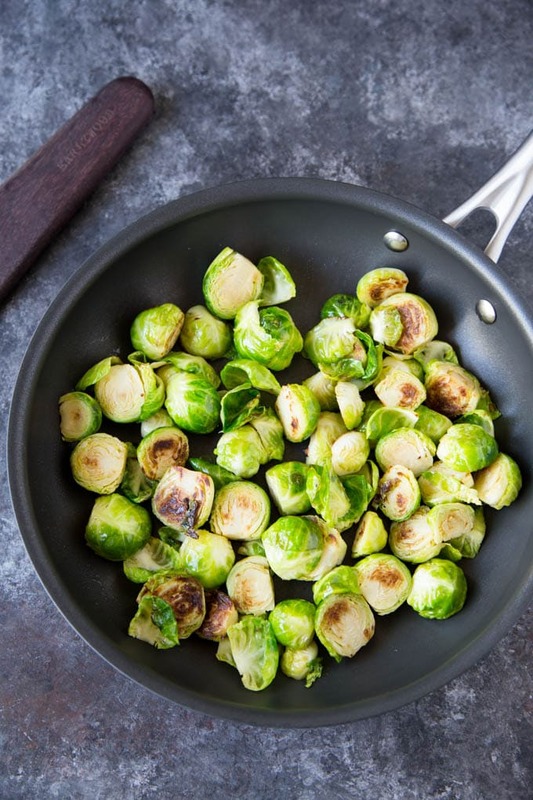 Have you tried Pan Searing Brussels sprouts? This is one of my favorite ways to cook Brussels sprouts! Besides being really easy, the Brussels sprouts turn out firm to the bite but still very tender. Searing them in a hot pan gives them a wonderful toasty caramelized flavor. I love it when the edges of the sprouts get a bit charred and develop a deep smokey flavor that works so perfectly with this vibrant Creamy Lemon Parmesan Pasta. Not a fan of Brussels sprouts? No worries, you can easily substitute arugula, asparagus, or fresh spinach. Time saving tips: look for pre-cut Brussels sprouts at your local grocers. More and more grocery stores are carrying fresh produce that is pre-cut and ready to cook. My local Safeway carries them in the same section that you would find packaged lettuce etc. Cook pasta according to package directions (al dente). While pasta is cooking prepare the Brussels sprouts (see step 2 below). Drain pasta and return pasta to pot, reserving about 1 cup of pasta water. Trim ends off Brussels sprouts and cut in half lengthwise. Heat 1 Tbsp olive oil in a large skillet over medium-high heat. Once skillet is very hot place Brussels sprouts cut side down in skillet. Reduce heat to medium and sear until golden brown (about 3-5 minutes). Turn sprouts over and sear other side until golden brown and tender (about 3-5 minutes). Remove Brussels sprouts from pan and set aside. Return skillet to stovetop and heat remaining 1 Tbsp olive oil on medium . Add garlic and cook for one minute. Add half & half (or cream) and lemon zest. Bring sauce to a boil and reduce to a simmer until sauce thickens ( about 6-8 minutes). Stir in Parmesan cheese and lemon juice. Pour sauce in pot with cooked pasta. Add seared Brussels sprouts. Heat as necessary until pasta and Brussels sprouts are warm, adding reserved pasta water as necessary for sauce to coat the pasta ( you may not need the full 1 cup reserved water).Add salt and pepper to taste. Transfer pasta to a bowl and garnish with crumbled bacon, toasted walnuts or extra Parmesan cheese if desired.